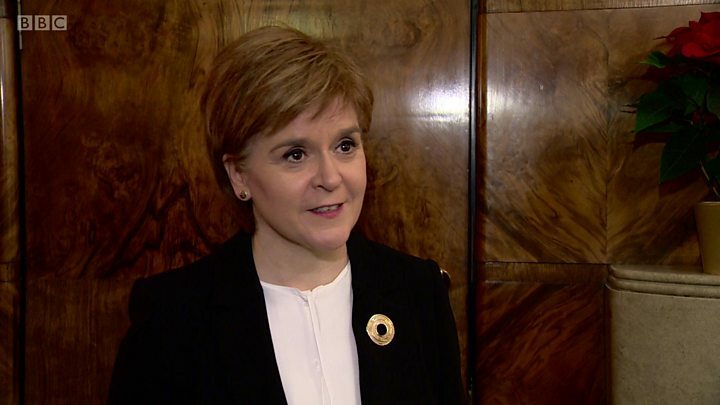 Scottish First Minister Nicola Sturgeon has said there is "no good reason" why Scotland should not get a similar Brexit deal to Northern Ireland. It has been suggested that the UK might be prepared to accept that NI effectively remain in the EU single market after Brexit. Talks between UK and EU leaders have not yet resulted in an agreement. Theresa May said "differences" remained between the two sides but said she was "confident" a deal could be struck. Amid speculation that Northern Ireland could be given a special deal, Ms Sturgeon questioned why other parts of the UK should not - a position echoed by London Mayor Sadiq Khan and Welsh First Minister Carwyn Jones. Mr Khan said such a move would have "huge ramifications", while Mr Jones said different parts of the UK could not be treated "more favourably" than others. Kuenssberg: Brexit and Ireland - what now? Mrs May is meeting European Commission president Jean-Claude Juncker and European Council president Donald Tusk, in the hope of coming to an agreement on the first phase of Brexit talks ahead of a summit in 10 days' time. There have been reports that Northern Ireland could retain "regulatory alignment" with the EU - although the final wording of any potential deal has not yet been confirmed. Belgian MEP Philippe Lamberts told BBC Political Editor Laura Kuenssberg that the UK had made a concession over the Irish border, saying ministers were prepared to accept that Northern Ireland remain in the single market and customs union in all but name. However Downing Street sources have sounded a note of caution, suggesting there are "still moving parts" over the deal. Ms Sturgeon posted on Twitter: "If one part of the UK can retain regulatory alignment with the EU and effectively stay in the single market (which is the right solution for Northern Ireland), there is surely no good practical reason why others can't." She later told the BBC she wanted to see an outcome "that's right for Ireland", but said Scotland would be "doubly disadvantaged" if NI was allowed to effectively stay in the single market and Scotland was not. She said: "The UK government appears to be accepting that parts of the UK can effectively stay within the single market. If that's good enough and possible enough for Northern Ireland, there's no reason why it can't be the case for Scotland." Mr Khan said there could be "huge ramifications for London" if Mrs May "conceded that it's possible for part of the UK to remain within the single market and customs union". Mr Jones said: "We cannot allow different parts of the UK to be more favourably treated than others. "If one part of the UK is granted continued participation in the single market and customs union, then we fully expect to be made the same offer." Ms Sturgeon has long argued that Scotland could remain in the single market as the rest of the UK leaves. Her government's paper of Brexit proposals, which was published in December 2016, argued that Scotland could stay in the single market through the European Free Trade Association (EFTA) and the European Economic Area (EEA). But Brexit Secretary David Davis rejected the idea, saying there were "clear barriers" which could create "additional controls and checks on trade within the United Kingdom". He stressed that the UK government wanted to achieve "the freest and most frictionless trade with the EU" while "maintaining the deeply integrated trade and economic relationship with the EU". But he said "any divergence between EU and UK law" could lead to "new barriers to trade within our union", and "significant disruption to the internal market". He added that "businesses could face a confusing mix of regulatory regimes". DUP leader Arlene Foster said her party "will not accept any form of regulatory divergence" that separates Northern Ireland from the rest of the UK - with her intervention apparently proving crucial. Meanwhile Irish Taoiseach Leo Varadkar said the wording of a deal over the border had been agreed in the morning, and said he was "surprised and disappointed" that the UK government was subsequently not able to follow through on it. Mrs May said that while progress had been made in talks, "on a couple of issues some differences do remain which require further negotiation and consultation". However both she and Mr Juncker said they were confident of coming to an agreement before the summit on 15 December. The Commission president added: "This is not a failure, this is the start of the very last round. I'm very confident that we will reach an agreement in the course of this week."